Fog recoiled from the touch of Lady Mist's dress. Before entering Neovia, the blue Buzz checked her purse. There was enough for lunch and extra; her manuscript was also safe. She sighed in relief and continued on her way to the Crumpetmonger. Over her shoulder she kept her umbrella open, one that was the same dusted purple as her dress, even though there was no need for it on this rainless and sunless day. In Neovia, Lady Mist avoided eye-contact with anyone, and they did the same. She was not a hated pet, but her steel will was hard to warm up to. The Crumpetmonger was just ahead, but something caught the Buzz's eye. A yellow Lupe was sleeping against the fence of the store. He wore wet, shabby clothing. In front of him was his hat, its belly empty of coins. Lady Mist took a few points from her purse and dropped them in the stranger's hat, their clanking waking him up. “Ah, thank ya, ma'am,” the Lupe said sleepily. “Will that be enough for a good meal?” Lady Mist asked sullenly. “Aye, it will be. You know, eating with a friend will make a good meal a feast.” The Lupe smiled. Some of his teeth were missing. 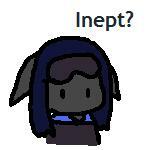 “Hmmm.” Lady Mist said nothing more and went inside the the Crumpetmonger, letting the Lupe follow of his own accord. After her charity, it seemed she and the Lupe only had enough for small loaves. They ate on the tables just outside the store. “I see.” Since the Lupe told his life story, Lady Mist took out her manuscript to make revisions. “What ya got there, miss?” Gibber sniffed curiously. “I can edit my own work beautifully.” Lady Mist snorted, disbelieving this bum could even read. “A horror story?” Lady Mist jeered. “My favorite kind.” Gipper smiled. His scruffy tail whacked his chair. Lady Mist's claws gripped the manuscript she'd slaved weeks over for perfection, not sure what to do. She looked around, as if fretful that someone would see her talking with this rogue. “Ya have my promise.” Gipper held up his paw in oath. “We shall meet here then,” Lady Mist said. “A fine idea,” Gipper agreed. “I suppose you'll want something in return then?” Lady Mist added grudgingly, still not trusting the Lupe. When the Buzz walked back home, Gipper set off to make money for tomorrow's lunch. The Lupe was able to find a small job at Chesterdrawers' Antiques to move heavy furniture for customers and dust the priceless plates. The owner, Alabaster Chesterdrawers, allowed Gipper to sleep in an empty room for the night. Having enough points to surprise Lady Mist with a meal of steak and golden mashed potatoes, Gipper was excited to read the story. As his eyes absorbed every word, he understood how the 'public' might be uneasy with Lady Mist's tales if they were all like this one. On the last page, Gipper was enthralled with a satisfying chill, but a peculiar red symbol of a circled pair of mandibles interested him. He did not understand it, so he assumed it was only Lady Mist's artistic signature, and thought it was lovely. Gipper had slept, woke up early for the first time in thirty years, bathed himself and his clothes in the river, and went to the Crumpetmonger. He waited with the manuscript under his paws, thinking over what he should say to Lady Mist. Past lunch the lady had not arrived. Gipper became worried and went inside the the Crumpetmonger to ask the owner for help. “Which house is hers?” Gipper asked, feeling that he was at the limit of anxiety. “Ah, thank ya.” Gipper lifted his hat and wished the Meerca a good day. Fog Road lived up to its name. It was a narrow road walled by pine trees, covered in a heavy rug of gray fog that shifted like an animal disturbed by Gipper's presence. Animal howls rang throughout the forest. Snapping twigs seemed to snap closer behind Gipper's back. After walking this dreadful road, Gipper could finally make out the outline of a mansion in the fog. The Lupe knocked on the door. It was opened by a large, but depressed grey Grarrl. He had mustache that drooped like garden vines, and was dressed in a fine tux. “Good day, sir,” the butler Grarrl said. “What have ya done to Lady Mist, Devil?” the Lupe snarled. “Sir,” the butler growled, “I'm afraid you've lost your welcome and shall have to leave.” The butler slammed the door. After minutes of hitting the door Gipper's paw began to hurt and he gave up. The Lupe sat on the steps and held the manuscript, studying the strange red symbol with teeth on the last page. Being a supernatural hobbyist, it was only eventual that the story of Lady Mist's disappearance would reach Button's ears. The striped Xweetok had traveled all the way from the city to Neovia. The culture was something promising hundreds of other ghost stories if the one of Lady Mist did not fulfill her, so she became more excited. However, when she started asking the folks where Lady Mist's house was, they would snap at her. “Okay, I get it!” Button finally yelled. She went to the Crumpetmonger to get a pastry. She sat down by the front door and ate it in frustration. “What be bothering you?” the owner of the bakery asked, curious to see such a sad stranger in these parts. “Yeah.” Button shrugged. She was never one to get to exciting places early. “I hope Gipper can convince you to leave, but I won't have any regrets if the Earth has one less fool.” The Meerca went back into her bakery. Button ate the rest of her pastry and set off. She found a scratched out sign pointing to Fog Road and followed the mysterious trail. The Xweetok spun around. If it wasn't for the yellow fur, Button would have mistaken him for a Halloween Lupe because his eyes burned and his back was hunched over from years of running and chasing off intruders. “But—but don't you want to know what happened to her?” Button said. “LEAVE.” The Lupe snapped his teeth inches away from Button's back, scaring the Xweetok into a bush. When Button heard the Lupe's footsteps moving away, her ears peered over the leaves of the bush. Gipper was still prowling nearby, Button could barely see him. He was sniffing the air, rotating his ears in every angle. The fog rolled up to his waist, thick as snow. “That's it!” Like a Hissi, Button crouched down onto her belly and crawled slowly. Gipper did not see her and Button made it out without alarm. When she crawled far away enough, she got back up and ran towards the mansion. She made it to the front door, and looked over her shoulder to see if the Lupe had followed her. Sure that she was alone, Button knocked on the door. A tall, grey Grarrl butler opened the door and looked down at Button with its red dozy eyes. “May I help you?” he asked her. The inside of the house was clean and well decorated, but it had depressing blue and gray colors. Furniture had clawed toes, and snarling gargoyles rested upon every high perch. The Grarrl led Button into a more lively room with a fire burning. Button could not see around the butler's wide back who was in this room. “Madame Catena, a visitor has come. She is interested in someone called Lady Mist. I do not know who she means,” the Grarrl said. The butler stepped aside, allowing Button to pass. When the Xweetok saw the master of the house, she became too stunned to move. “Why, don't you have a lovely coat?” Madame Catena said. She was a finely dressed Zafara, but the soft colors of her dress and shawl was overpowered by the steel of her wheel chair. Button did not recognize what color the master was until an aquatic fin accidentally slipped out of the blanket covering Catena's lower body. “He—hello, Madame Catena. Thank you,” Button quickly added. “Who is this Lady Mist you're looking for?” Madame Catena asked. Madame Catena had listened very carefully with her chin settled on top her paw and both ears high with attention. When Button finished the Zafara shook her head and pushed her wheelchair over to the window next to a marbled chest table. Their quick game became a battle lasting for hours. Button and Madame Catena talked about their past, their aspirations, family, and dreams. The Xweetok felt so comfortable with the old Maraquan that she confidently told the master about her ghost-hunting hobby. For the whole time Eallair monitored them silently. “Right away, Madame.” Eallair bowed. Button followed Eallair up a set of stone stairs. While they climbed, the gray Grarrl mumbled depressively. “She sounded excited,” Button said. “Hmm. This is where you'll spend the night, Miss Button.” Eallair presented a fine bedroom. The butler said nothing more. Before Button closed the door, she noticed Eallair was taking the time to stare at a giant portrait in the hall of what appeared to be a young Madame Catena and her mother and father. He rubbed his claws along the golden frame and sighed. Button left Eallair alone, not sure why the grey Grarrl was suddenly feeling depressed all of a sudden. As she made her bed, there was a soft click from the door. “What the?” Button cried when she tried to open it, but found it was firmly sealed. The Xweetok studied the guest room, searching for a way out. There was a stained glass window, but its wooden frame was nailed shut. She moved dressers, bookshelves, and even the bed out of place for an escape route, but there was nothing to be found until she pushed a chest with gold leaf out of the way that hid the ventilation duct. With all of her strength she pulled off the cover of the duct, falling backwards when it came loose. Getting inside was a tight squeeze, but her back paws could push her forward quickly. There wasn't enough time to check where it led to; she had to get out or she'd choke from dust. Button bashed her head against the cover until it broke open. It was Madame Catena's room, and the madame herself was sitting upright in bed in fright. “I'm sorry, Catena, but your butler locked me in the bedroom,” Button explained. “Eallair did that?” Concern appeared on Madame Catena's face. The door clicked open. Button panicked and hid under the bed. She saw Eallair's clawed toes step up to the edge of the bed. “Are you comfortable, Madame?” Eallair asked his master. The butler did not reply, but sat down on the edge of the bed. The springs pressed against Button's back. A sad sigh came deep from the Grarrl's chest. Eallair got off the bed. The creak of the springs muffled Button's gasping for air. When the butler left, Button crawled out from under the bed. Madame Catena was quietly crying. “I—I've never seen him so angry,” Madame Catena sobbed. Button let Madame Catena hold onto her shoulders and she carried the Maraquan Zafara outside. Button tried to move swiftly and quietly, but Madame Catena was heavy and her fins were difficult to control. They crouched behind a large vase. Eallair stomped past them, snorting with rage and swinging his mustached muzzle like a pendulum. He stopped at the stairs, but didn't find their scent going past there, so he turned around. Sure that he was gone, Button picked Madame Catena back up. The Zafara's tail hit the vase, knocking it over. Its shatter brought out an echoing roar from the enraged butler. “Run, Button, run!” Madame Catena shrieked. The Xweetok ran down the stairs, nearly falling over and dropping the master several times, but there was no time to be careful. Eallair was getting closer. They made it to the door. Button set Madame Catena down and tried to unlock the door, but the mechanism was vandalized. Madame Catena screamed. Eallair was standing at the top of the stairs,. His fangs were bared, and his pink eyes radiated with anger. “Return my master!” Eallair jumped, landed on the bottom step and stomped towards them, roaring monstrously. Button screamed and ducked, covering her head with her arms and preparing for the hurt to come. Nothing happened, and the air had suddenly become quiet. Button looked up and saw that everyone had disappeared. The glory of the mansion had also vanished. Instead of clean furniture smelling of violets, everything was neglected, dusty, and smelled strongly of dead insects caught and forgotten in spiderwebs. “What?” Button pushed open the door, now a moldy green, and the rusted lock gave in, allowing Button outside. All the fog had gone. Sitting on the front step was the yellow Lupe, Gipper. He looked up, and, when he saw Button was safe, he went up to her and hugged her. Button pushed herself out of the Lupe's arms. Taking in a long breath, Gipper revisited his memory with a mourning voice. “Three years ago, Lady Mist and I met. She had a story she hoped to send to the Neopian Times, but was worried because she'd been rejected before. Beforehand I think she had done something to her story before letting me read it.” Gipper pulled out the last page with the mysterious red fanged symbol. “I brought this to a witch named Mogilev. He said it was definitely a spell. Lady Mist was so desperate to get into the Neopian Times that she practiced risky magic to curse her story. “Is Lady Mist okay?” Button asked. Feeling pity for the Lupe, Button held Gipper's paw as he cried. In the forest, the fog danced around the stump of trees, gathering magic for the spell to reanimate once again.